Welcome to Part One of denkbot’s meta-analysis on combat robots: Introduction to Robot Archetypes! Each of these archetypes has its own set of distinct, and probably more familiar, sub-types. This article will detail the sub-types of robot in each archetype. The STATIC archetype contains three types of robots: Rammers, Spikes, and Wedges. The most straightforward weapon in combots is the Rammer: a simple, yet eloquent design. This design is rooted in the K.I.S.S. (Keep it Simple Stupid!) design philosophy: The fewest moving parts and the least amount of failure points in a sturdy and well designed chassis, using the physical structure of the robot itself as the weapon. Building upon this concept and following the mantra that “spikes make everything cooler” the next sub-type in this archetype is Spikes. By placing static spikes on the ramming surfaces of the robot, this design aims to piece exposed wheels and weak points in opponents armor. The dominant sub-type in this archetype, and the weapon of choice for the first several years of Robot Wars, is the Wedge. Employing the last of the six simple machines, a portable inclined plane is used to get underneath an opponent and flip them. 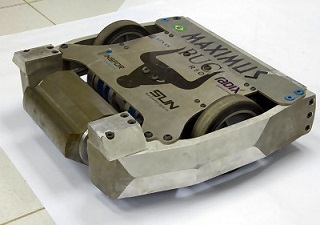 The enduring legacy of this design can be seen in NINE-TIME heavyweight champion (five RoboGames titles and four ComBots Cup championships) Original Sin. The LIFT archetype contains three types of robots: Arm/Wedge-Lifter, 4bar, and Forks. Building upon the tactic of getting underneath an opponent, the Arm/Wedge-Lifter sub-type aims to disable an opponent by tipping them over via a lifting arm. By lifting an opponent and removing one or more of their drive wheels from contact with the ground, it becomes easier to push and maneuver them. Taking the lifting arm concept and engineering it into the most efficient possible profile is the 4bar sub-type. This design uses a four-bar linkage to fit the entire lifting mechanism into a seemingly flat chassis, making it extremely hard to flip. The dominance of this well engineered design is immortalized in the SIX-TIME heavyweight champion (two Robot Wars and four BattleBots championships) BioHazard. Abandoning the influence of the wedge and finding inspiration from more industrial settings, the Forks sub-type aims to roll an opponent via lifting forks. Utilizing a pneumatic lifter, the competitive prowess of the LIFT archetype and Forks sub-type is highlighted by the TWO-TIME BattleBots heavyweight champion Vlad the Impaler. The FLIP archetype contains two types of robots: Flippers and Launchers. While other designs (like wedges and lifters) attempt to roll an opponent over, the Flipper aims to send them air born via high powered pneumatic action. Like the evolution of animals on isolated islands, the Launcher is a specialized form of flipper that evolved due to their isolation in the UK and the specialized rules of the Fighting Robot Association. These robots are designed to launch an opponent out of the ring, a win condition not present in BattleBots- but still devastating to opponents. The GRIP archetype contains three types of robots: Crushers, Pincers/Jaws, and Grapplers. The GRIP archetype aims to control an opponent, as opposed to landing a single fatal blow. The foundation of this archetype is the sub-type Crusher, which aims to grab an opponent and impart lethal piercing force via hydraulic pressure. With mechanisms similar to Crushers, but not designed to pierce armor, the Pincer and Jaw sub-type aim to clamp on to an opponent in order to maneuver them to an unfavorable position. Pairing the proven low attack of a lifter and the control power of a crusher, the Grappler sub-type aims to take full control of an opponent and disable them in whatever way they see fit. The STRIKE archetype contains four types of robots: Hammers/Pick-Axes, Sit-and-Spin, Torque Reaction, and Lances*. Just as early hominids discovered the power of simple tools to increase their influence over their environment, so too did early robots. By swinging a mass at the end of a handle, the force applied to the swing (assisted by gravity) is multiplied by the length of the handle- drastically increasing the kinetic energy delivered at the point of impact. This principle of physics is the foundation of the Hammer and Pick–Axe sub-type. Taking design optimization/simplification to the maximum, the Torque Reaction sub-type removes the need for any additional mechanism to strike an opponent by placing the weapon mass directly onto a single drive axle. By changing the axis of rotation the Sit-and-Spin sub-type uses the same principles described above but is free to rotate, building rotational inertia, until it strikes an opponent. The SPIN archetype contains six types of robots: Full Body, Overhead, Bar, Horizontal Disc, Vertical Discs, and Drum. Similar to the Sit-and-Spin design which spins the entire chassis to build up energy, the Full Body sub-type continuously spins the outer shell (usually containing the majority of the mass of the system) at high speed. The high inertia of the heavy outer shell makes these robots very destructive and very difficult to control. A slight modification to the full-body spinner, the Overhead sub-type continuously spins a large mass from the top of the robot making it difficult to attack the chassis. Taking the continuously spinning weapon concept to a destructive maximum, the Bar sub-type takes as much weight as possible and places it in a massive continuously spinning bar. This design, once up to speed, delivers very high impact blows aimed and destroying the opponent. Aiming for higher maneuverability and less potential self-destruction, the Horizontal Disc sub-type uses a smaller continuously spinning disc to cut an opponent. By changing the axis of rotation, the Vertical Disc sub-type attempts to flip and/or damage an opponent via continuously spinning disc. The upward rotation of vertical discs allows this design to use the mass of the opponent against them, to allow the teeth of the spinning disc to translate more of their stored energy into the target. Taking the flipping and destructive power of a vertical disc spinner and pairing it with the mass of larger spinners, the Drum sub-type uses a continuously spinning heavy cylinder with teeth to store large amounts of energy quickly. Unlike a bar spinner, which spins a large mass far from the center of rotation, the drum spinner spins a large mass along a compact axis allowing it to get up to speed very quickly. The high power and quick “up to speed” time of this design make it a very effective weapon system. The OTHER archetype contains three types of robots: ART, Hybrid, and the catch-all “OTHER” for those robots we just didn’t know how to categorize. The playground of great minds like Mark Setrakian, the ART sub-type contains robots that, while not the most effective in combat, are marvels of form over function. The HYBRID sub-type contains robots that fit into several of the previously discussed archetypes and sub-types. The OTHER sub-type contains robots we just didn’t know how to categorize, because they were either very unique weapons or we didn’t have data on them. From the “STRIKE” archetype above, the Lance sub-type contains robots that use a powered spike as their primary weapon. These robots attempt to pierce an opponent via either a powerful pneumatic lance or oscillating piercing spikes. Now that we have a clearly defined organization of robot designs, we can take the robot fighting data from the last two decades and statistically determine which of these are the most effective.